The first seeing eye dog program opened its doors on this day in Texas, nearly 90 years ago. In that time, seeing eye dogs have helped thousands of people. To celebrate this, 1FUR1 wants to take a look at some of the inspiring relationships seeing eye dogs have formed with their masters. Seeing eye dogs, one type of guide dog, help their masters regain a sense of freedom and independence. There are many non-profits throughout the country who work hard to train dogs for the blind. These foundations deserve our respect and support. Morris Frank went blind at the age of sixteen. He hired a guide boy to help him to do everyday things. However, he was not nearly as loyal as a dog and often left Frank alone, bored and helpless. Frank was stuck with no help. His father read him an article about an American dog breeder in Switzerland. Frank’s father wrote a letter to the woman, begging to breed and train a dog for his son. She decided to take on the challenge, training two dogs, one who would later become Frank’s dog, Buddy. Buddy led Frank around busy New York City, allowing him to live freely and independently, while paving the way for future seeing eye dogs. Figo, a seeing eye dog in New York, was named ASPCA Dog of the Year, and it is no wonder why. Figo and his master were crossing the street when a bus hit them. Figo acted fast when he saw the bus coming, and jumped in front of his master to shield her. He broke a few bones, and was quite injured, but would not leave her side until the ambulance came and took her to the local hospital. Not to worry though – both were given a clean bill of health and continue to work together. Figo was honored by the ASPCA in November of last year for his harrowing acts. He is truly a hero. 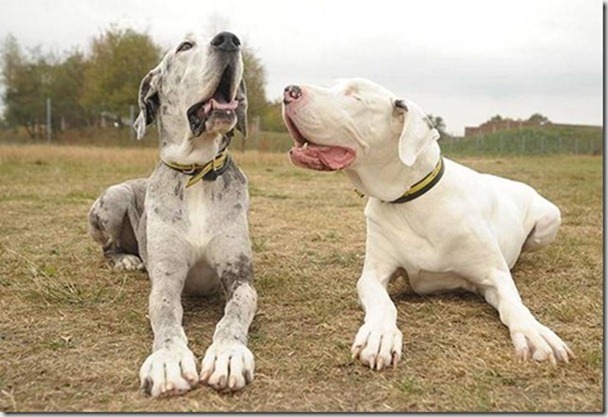 Blind Dogs Need Help, Too! Could seeing eye success stories get any cuter? There have been two notable cases of seeing eye dogs helping their blind counterparts. Kiaya, an Akita who went blind at the age of ten, had no trouble adjusting, as she had the help of the two dogs who lived with her. The two boys walk on either side of her, assisting her while letting her continue to be a curious, intelligent pup. There is no doubt in my mind that the trio are utterly adorable when they are out and about in their Michigan hometown. The other story of a seeing eye dog for another pup has become an internet sensation. Two Great Danes, Lily and Maddison have been inseperable for the last five years. Lily is blind, but has led a fulfilling life with the help of Maddison. The internet has fallen in love with these two gentle giants, and it is easy to see why. Seeing eye dogs are amazing creatures. They do fantastic work and deserve the world. Guide dogs, in general, need as much support as they can get. That is why we, at 1FUR1, are committed to our service dog program, along with our animal-assisted therapy and animal-assisted activity programs. Please donate so that we can help as many animals and people as possible.